Here's the room stripped out and ready to be re-done. I've never cared much for the bathroom. And this room is much too long and deep to be very useful. So...I've split the room in two. The end with the window will be a hallway and the front two thirds will become a more manageable size for a bathroom. Then I made a very shabby old door from scratch! I made some new walls with rusty tin wall panelling. And I made a transom window to go above the door. The light shines through the pretty window and door glass but it's very hard to photograph! That was what it needed! Oh, yes. I'm happy with it now! The ceiling - with a little mildew...because everything's a bit run down in the farmhouse. 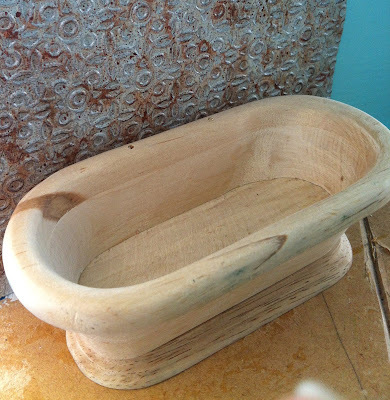 The bath was an unfinished wood one I bought years ago. I finally got around to painting it. I couldn't decide whether the bath should be copper or zinc so I went with copper on the outside and zinc on the inside. There's plenty more to be done! I've finally realised I need to finish renovating all the rooms before I fill them with the fun stuff - otherwise everything keeps falling over. The hallway on the other side of the bathroom door is almost done. Soon to be revealed!